Dark matter is hypothetical matter that does not emit electromagnetic radiation, such as light. Although no conclusive evidence of dark matter has been found, it is believed to exist to explain the rotation of galaxies. Currently, it is believed that dark matter accounts for roughly six times the amount of ordinary matter that we can see – of the energy in the universe, 23% is dark matter, 4% is ordinary matter and the remainder is considered “dark energy” (not discussed here). In the computer simulation below, the galaxy on the left is the expected observation of a galaxy where matter is concentrated towards the center. As a result of mass being greater in the center, stars closer to the center would have a greater velocity than stars further from the center. An example where this is true is within our solar system, where Mercury has a faster velocity than Neptune, because it is much closer to the Sun. Strangely, with galaxies, it is different. Observations of galaxies in the universe appear like the simulation on the right, where the velocity of stars are constant as distance increases from the center of the galaxy. According to the known laws of gravity, these galaxies should not be stable unless there is more matter to hold them together. Since the unaccounted for mass is not visible, it is called dark matter. The EWT model does not have a clear explanation of dark matter. However, since EWT has a different explanation of gravity from modern theories, there are new possible explanations when considering the new model of gravity. There are two categories of explanations that might be possible: 1) that dark matter is indeed matter and may be known particles in the universe, or 2) that dark matter is not matter and the observations of galaxies can be explained by parameters in the universe that are variable, and not constant. Particle physics is focused on finding a new particle that accounts for dark matter, but what if it consists of particles that are already known? To visit this possibility, the gravitational model of EWT that accurately calculates large bodies in the solar system, needs to be revisited. The EWT explanation of gravity is due to a conservation of energy. As particles spin, some of the electric (longitudinal) waves are converted to magnetic (transverse) waves. The reduction of electric waves between two particles causes a shading effect. Lower amplitude causes an attraction. However, it’s only seen in large bodies where atoms cancel electric forces. See the section on gravity for more details. Gravity as a result of particle spin, creating a shading effect as particles lose longitudinal wave amplitude as spin energy is converted to transverse waves (magnetism). With regards to the two larger neutrinos (#1 and #2), they do spin and are electrically neutral. If enough of these neutrinos exist within galaxies, it could account for dark matter. The smallest neutrino – the electron neutrino – is not listed here. In the Standard Model, the electron neutrino is believed to spin and be electrically neutral. However, in EWT, it is a single wave center and may not account for a loss of longitudinal wave energy from spin. The third possibility is a combination of an electron and positron pair, which occurs during annihilation. Modern physics suggests that these two particles disappear, but the EWT model of annihilation proposes that the particles are still there, but undetectable as they no longer have mass and are electrically neutral. Although they would not have mass (as standing waves collapse), the particles would still absorb longitudinal wave energy for spin and they would not be magnetically detected because their transverse waves cancel. Thus, this particle pair meets the conditions requiring spin and being undetectable. There is another possibility which is that the rotation of galaxies is not due to missing matter, but due to properties of the universe itself which may not be constant. The most notable is the speed of light (c). It is thought to be constant, but what if it is indeed variable? In EWT, all energies and forces were derived from a single equation. The equation is shown below again with reference to these constants and variables. In the EWT model, V (volume) is variable, but the remaining are constant wave values. What if one or more of the following were variable? Density is the obvious one. This is a parameter of the substance of the universe that allows waves to flow – the aether. What if it is not constant and is more dense near the center of galaxies? An analogy is water, which allows water waves to travel. Water is more dense at the bottom of the ocean (closer to Earth’s core) than the surface. If density is indeed variable, then it could affect wave speed. Waves are known to travel at different speeds through substances of different densities, such as the speed of sound being different in air vs water. 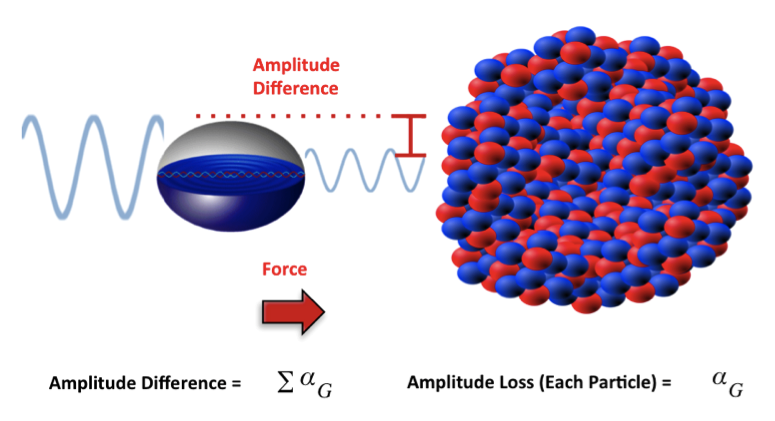 The wave properties of wavelength and amplitude have a default constant in EWT, although amplitude is constructive based on particles in proximity. If density is variable, it could affect these default constants. Wavelength, in particular, is the measuring stick for matter because it affects distances between atomic orbitals. If wavelength is shorter or longer, it would cause the appearance of matter contracting or elongating. This could have the appearance of what Einstein referred to as the “warping of spacetime”. Video – What is Dark Matter? The What is Dark Matter video below describes the reason that scientists believe that dark matter exists and some possible concepts using EWT to explain it. Previous: What is Dark Energy? Next: What is a Mole?